Recently, I have been eating a lot more at The Green Edge (see previous visits here) since their have been some changes in ownership and direction, making it a much better experience. So this year I was excited to go along for their annual Christmas dinner! They have a special menu for the night, and you can choose from an entree, a main, and a dessert for a three course feast. I went with my friend Melanie, and we each chose a different option off the entree menu (there was also a 'Festive Trio of Dips' on offer). 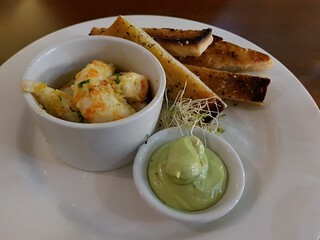 Melanie went with the Garlic Prawns with Avocado Puree. I have a well known aversion to vegan prawns, so I didn't sample it, but she raved about them! Definitely her highlight of the night. They made them using the Lamyong vegan prawns, so if you are into vegan prawns, that is apparently the business. 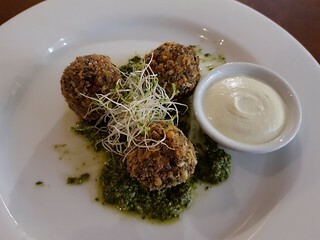 I had the Arancini Balls with homemade dipping sauce, which I loved. They were crispy and savoury, and the sauce was so creamy. I could have easily devoured a plate of these with a vat of sauce. This was my highlight of the night as well! 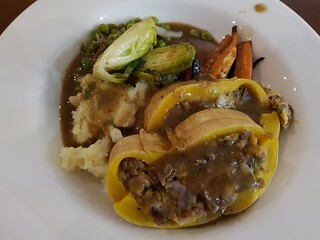 Main was a stuffed roast with all the trimmings - mashed potato, peas, brussels, carrots and gravy. 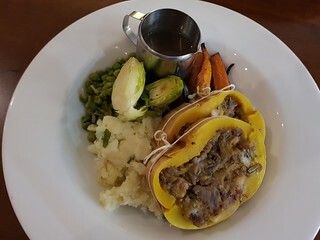 There was a choice between either a stuffed seitan roast or a stuffed butternut roast, and we both chose the butternut. It had cranberries and pistachios in the stuffing, and was quite lovely. The carrots were nicely roasted, and the mash was buttery and good, but the peas and brussels were mushy and overcooked. At least there was lots of good gravy to drown everything in. Dessert was where I started to go off the rails a bit. 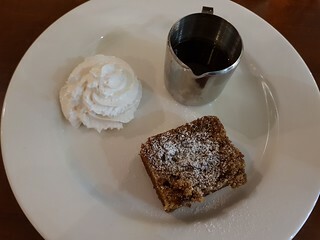 I ordered the Sticky Date Pudding, because even though I am not a big fan of super sweet things I love sticky date pudding. I got mine with soy whip instead of coconut ice cream. The pudding was great, though the sauce was very sweet (as expected). 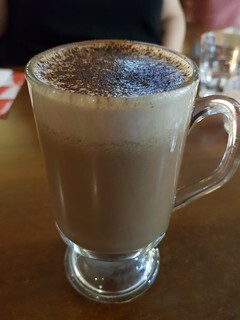 But then I also ordered a Pumpkin Spice Hot Chocolate, which was delicious but was also very sweet. A great clash of super sweet occurred, and I struggled to finish it off. Next time, just the dessert and maybe some peppermint tea!! 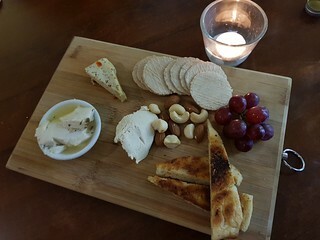 Melanie went with the cheeseboard (there was also a spiced chocolate mousse as the third option), which was a nice spread of three different cheeses (Fenn Smoked Sesame, Treeline Herb, and Botanical Cuisine Feta), with crackers and bread and grapes and nuts. 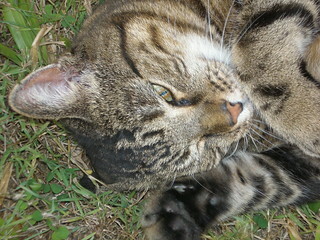 Speaking of loved ones missed at Christmas, here is our beautiful family boy Possum. He passed away a few years ago. The stuffed butternut roast looks great, and hooray for good gravy! I was so full at the end, I was really glad I got the butternut and not the seitan, it would have been so heavy in my tummy. Oooh, that roast and the hot chocolate! I'm with you on vegan prawns. I never liked seafood, so I'm not really into the vegan versions. Except for Gardein fishless filets. I'm totally down with those! I've never tried the Gardein fishless fillets because I am so meh about vegan seafood, but so many people rave about it that I feel like maybe I should.